Punch Brothers defy RNC, DNC and SPBGMA and stand in solidarity with "Circus Freaks". In honor of the 100 year anniversary of the song "Take Me Out to the Ballgame", ESPN created a Battle of The Bands allowing sports and music fans to vote online for their favorite contestant. The initial round consisted of 9 different contestants, including popular musical artists REO Speedwagon, Branford Marsalis, and Gretchen Wilson, among others. On Sunday night, the winners of the first round were announced live on ESPN's baseball tonight. The top 3 vote getters: Punch Brothers, Gretchen Wilson and Ozomatli. There has been a lot of buzz in inside circles that this campaign might go negative. The first round victory of Punch Brothers, the undisputed underdogs, with their primitive acoustic instruments and piecemeal wardrobes, sent shockwaves across the nation. People's fears of negative smear attacks were unfortunately realized the morning of Tuesday July 7. As of 3:30 PM, EST, neither the Wilson or Ozomatli campaign have denounced the smear. Major news outlets are scrambling trying to come up with any ties between the Punch Brothers and "Circus Freaks". 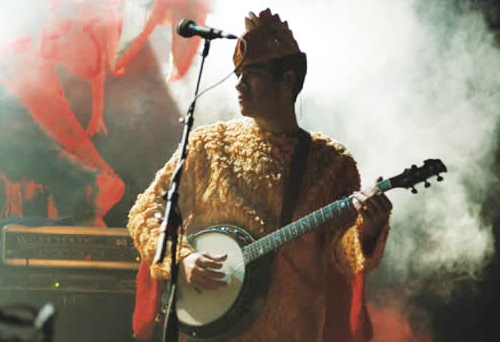 An image of punch brothers banjoist, Noam Pikelny, has surfaced online where he is seen performing in a Chicken Suit. Pikelny immediately issued a statement: "I will not apologize for my misspent youth. I also will not allow Carnies or Circus Freaks to become the new scapegoat of American Society. I believe Americans will see right through these vicious smear tactics, and the good name of Punch Brothers will be restored." ESPN.com - We made the Top 3!